“We need the kind of revival that will restore our people the old fashioned “fear of God" in the human heart. And reverence for the name of God. From the White House on down to the sidewalks of this town we hear God’s name used in vain. “We need a revival to stop the tides of sin, lawlessness and ungodliness that is literally swamping our nation and the world. “We need a revival that would change and restore the love of chastity and purity, that will put an end to formalism in our churches and make them stations where men are soul winners for God. “We need to restore a “sin consciousness” to our people. We need a revival that will cause those who call themselves Christians, to walk again with God, to separate themselves from the world, and will walk in the old paths and will know the difference between right and wrong. “The next thing we need is a “vision of God.” We need a clear understanding of His world. And this must come from the altar of Heaven. The prophet Habakkuk heard God speak, his soul was in tune to the Heavenly message. And because of the character of the message, which came to him from Jehovah, he was afraid. Now this is a starting place in all revivals. The fear of the Lord is the beginning of wisdom. “Men of all ages have been afraid when they heard God speak. They have responded to His call. When that call has come to them….Noah heard God speak. Abraham heard God speak, and left his father’s house. Moses heard God speak and went out to lead God’s people. “God has spoken to us. We have the Scriptures….a revelation of His will. He has told us in His Word what the ultimate result of unbelief will be. He has told us about the awful judgment….those who refused to repent. The trouble with the world is that it does not want to hear God’s Word. “Men today do not want to see God or hear Him speak. They are set in their hearts to do as they will. They want the world for themselves. They give expressions of their own passions and desires. “The prayer of the prophet Habakkuk should be the prayer of every prophet of God today. God is going to thunder His judgments against wrong doings. 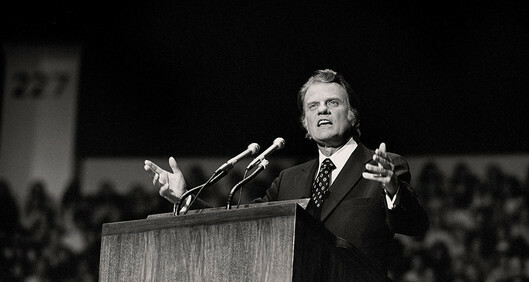 “In the second place, the world needs more than anything else…REVIVAL. Men today think they have found a remedy for individual, social, national, and world ills. New laws are passed. New forms of government. New constitutions are voted in. All these contain human error and human nature. “Social conditions will never be right until the people are right. President Taft put it this way, “There will never be an honest horse race until there are is an honest human race.” Dwight L. Moody expressed it in this phrase, “If you want clear water, it is not enough to paint the pump, you must clean out the well.